Our Pamukkale suite is a delicate and sumptuous place to relax and refresh. Decorated in cotton whites with soft and fresh textures and layers to match, this suite takes inspiration from the Pumukkale natural site in southwest Turkey. Pumukkale is famous for it’s natural springs and the white mineral residue that surrounds the mountains from the flowing water. Thousands of tourists flock to the springs every year to take in the healing properties of the water as well as the beautiful surroundings. The natural phenomenon gives the appearance of a cotton fortress up in the mountains, which is how Pumukkale received it’s name: ‘Pamu’ means cotton in Turkish and ‘kale’ means the castle. Drift away in your very own Cotton Castle in our Pumukkale suite, leaving the stresses behind to find inner peace and total relaxation. 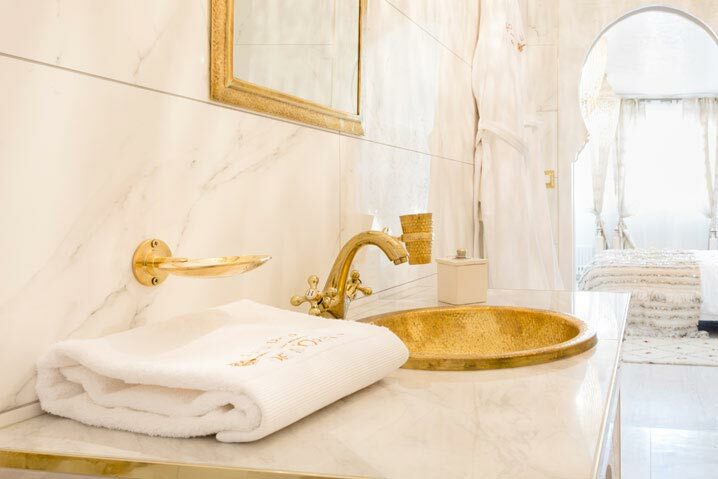 Take advantage of included access to our hammam and jacuzzi to find yourself totally rejuvenated. Oozing luxury and stunning attention to detail, our One Thousand and One Nights suite is inspired by the famous Middle Eastern folk tales. Drawing inspiration from the dramatic landscapes of dunes and the vast Atlas Mountains, our Timimoun suite transports you with it’s stunning ochre walls and colourful details. Our Majorelle suite is decorated in the iconic Majorelle blue and just one minute here will transport you to the heart of the Ochre City and it’s stunning botanical gardens!